Brokk is a manufacturer of remote-controlled demolition machines for use in the mining industry. Designed to be compact, adjustable and easy-to-operate, Brokk’s machinery is ideal for a wide range of mining tasks, including drilling, scaling, digging, breaking and grizzling. Founded in 1982, the company is focused on making machines that are small but very strong, making them ideal for underground mining situations. Today, there are more than 5,000 Brokk machines being used around the world. The remote-controlled nature of Brokk’s machines means workers can operate them from a safe distance. Brokk has been awarded ISO 9001 by Lloyd’s for the company’s quality management system for the manufacture of remote-controlled demolition robots. 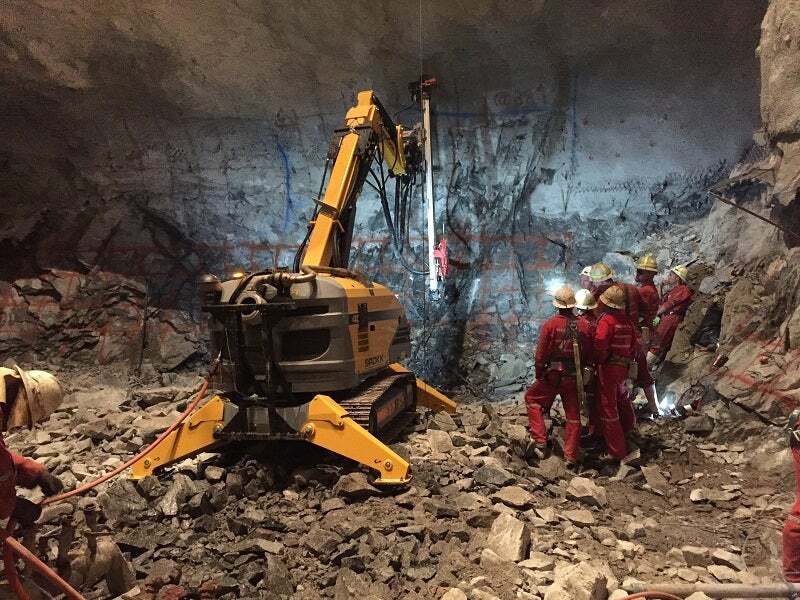 The Brokk 400D is a popular choice for underground mining applications as it features an excellent power-to-weight ratio and can be used in areas that do not have a power supply. It is 160cm wide and 186cm tall, making it very compact, but it has a high motor output of 70.6kW. This means the 400D is ideal for both enclosed and open spaces, making it a highly versatile choice for many mining operations. The Brokk B400D can also be fitted with a stainless-steel hood, heat-resistant hoses, additional protection for cylinders and an air-cooling system, enabling it to withstand even the toughest of mining environments. Brokk’s machines are designed to be very compact but highly effective, making them ideal for small, enclosed spaces that other machines would be unable to reach. The smallest of Brokk’s machines, Brokk 60, is designed to fit through doorways that are 60cm wide, and is less than 90cm tall. It features a 5.5kW motor and can easily move through small spaces, even being able to climb stairs if required. The slightly larger Brokk 100 is still very compact, but packs a punch with a 15kW motor output. Only 78cm wide and 115cm tall, the machine can be easily transported in a standard trailer and will fit in an elevator. For applications that require more power, but still need a very compact machine, the Brokk 160 is ideal, featuring a motor with an 18.5kW output, but a width of only 78cm and a height of 125cm. Attachments available for the 160 include a hydraulic drill, hydraulic breaker and a sorting grapple. Brokk also manufactures a range of larger machines, which are ideal for tunnelling projects and high-demand demolition projects. The Brokk 800 S has a reach of 9.4m, and is highly effective, with attachments including an MB 1200 breaker, beam grapple and shot crete. If you require a machine with specialist equipment or features, Brokk can custom-make your ideal product. As part of our bespoke service we offer design, mock-up, commissioning and final testing, and will provide complete operator and maintenance training. Brokk has a dedicated and highly knowledgeable team that can provide extensive after-sales support for any purchase. All machines are supplied with detailed, accessible manuals, and all distributors engage in continuous training to ensure they are up-to-date with the latest machine developments. Should you require any spare parts, we provide quick delivery and offer troubleshooting to ensure any problems are quickly resolved. Brokk will also tailor-make any specialist spare parts that are required. Our machines are designed to be easy to learn how to use, but for operators and maintenance workers looking to gain in-depth knowledge, we operate the Brokk Academy. This is a provider of training courses for Brokk equipment where participants are taught efficient methods, handling and maintenance techniques and tips and tricks to get the best performance from your machine. To find out more about Brokk’s products and services, or to make an enquiry, please contact us using the details below. Brokk, the world´s leading manufacturer of remote-controlled demolition robots, introduces the new Brokk 500, which features 40% more demolition power, the Brokk SmartPower™ electrical system, a more powerful breaker, extended reach and industry-leading serviceability. In line with their strategy to create value by extending the lives of group mines, Sibanye embarked on a project to mine the many support pillars which were left in place by previous mining operators. Brokk has released a brochure for the series 800 mining equipment. Download the free brochure or visit the company website for more product information. Brokk, the world's leading manufacturer of remote-controlled demolition robots, is proud to present the third new robot this year. The Brokk 110 represents the latest generation of demolition robots. Brokk, the world´s leading manufacturer of remote-controlled demolition machines, announces the new updated Brokk 120 Diesel Mark 2, the world´s smallest diesel-driven demolition robot. This compact machine can operate independently and un-tethered for over eight hours straight and effectively tackle jobs that no other machine can. MINExpo is one of the most important events for the worldwide mining industry, and the largest tradeshow for mining equipment and technology manufacturers in the world. Held between 26-28 September in Las Vegas, Nevada, the show is a fantastic opportunity to source solutions for the mining industry's biggest challenges. Since its commencement over 42 years ago, Electra Mining Africa, held between 12-16 September, has developed to become one of the biggest mining and industrial events globally. Brokk, a world leading manufacturer of remote-controlled demolition robots, introduces yet another new machine, the Brokk 280. The new robot features more power, the all-new Brokk SmartPowerTM electrical system, and a new rugged design with a combination of good looks and durability for tough environments. During 2016 Brokk celebrates 40 years of innovation as one of the world's leading manufacturers of remote-controlled demolition machines. The first Brokk machine that was introduced in Sweden 1976 meant a revolution in the demolition industry. And with the development since, Brokk has played the leading role in making demolition robots a vital tool to many projects and industries across the world. Brokk, a leading manufacturer of remote-controlled demolition machines, announces the all new Brokk 120 Diesel, the world´s smallest diesel-driven demolition robot. This compact machine can operate independently and un-tethered for over eight hours and effectively tackle jobs that no other machine can. Brokk, a leading manufacturer of remote-controlled demolition machines, has announces the all new Brokk 120 Diesel; the world´s smallest diesel-driven demolition robot. This compact machine can operate independently and un-tethered for over eight hours, and effectively tackle jobs that no other machine can. Brokk, a leading supplier of demolition robots, is launching a completely new product range, the Brokk Ex machines. These explosion protected machines are designed for use in hazardous environments, such as oil and gas industries, underground industries and other environments where there is risk of explosive gas being present. The new Brokk 400D is primarily aimed at meeting the ever increasing demands of the process, tunnelling and mining industries. The 400D is one of two diesel-driven models in Brokk's demolition machine range and will replace the older Brokk 330D for applications where electrical supply is limited or non-existing. The Brokk 400D is a great step forward; it is bigger, faster and stronger.